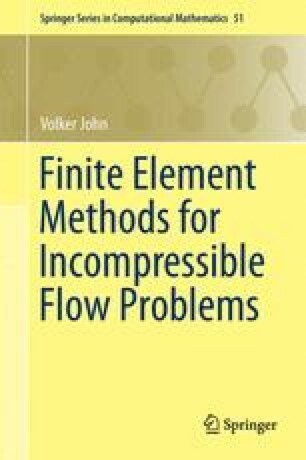 This chapter deals with the first difficulty inherent to the incompressible Navier–Stokes equations, see Remark 2.19, namely the coupling of velocity and pressure. The characteristic feature of this coupling is the absence of a pressure contribution in the continuity equation. In fact, the continuity equation can be considered as a constraint for the velocity and the pressure in the momentum equation as a Lagrangian multiplier. This kind of coupling is called saddle point problem.